Scalp Psoriasis Treatment – Our treatment is unique as it adopts a gentle but practical approach in controlling or removing scalp psoriasis. Firstly, we remove that irritating crust, then calm the underlying skin which effectively slows down the cell proliferation. Scalp Psoriasis can be a very unsightly condition that is very difficult to cure. Scalp Psoriasis can be controlled and in some cases sent into remission. We have helped thousands of patients over the years to control or remove psoriasis. If you would like to find out more why not give us a ring and speak with a trichologist now! We can offer free advice over the phone . Scalp Psoriasis presents as a chronic inflammatory disease which causes the skin to thicken producing silver/white or yellow scales. This itchy scalp condition affects 3% approx. of the population. Shows no affiliation to gender, race or skin colour. It is not contagious but can be passed on genetically. Nails may be affected (pitting or loosening). This dry scalp ailment will cause tightness and in many cases considerable discomfort. The dry scalp may be relieved with the correct application of moisture and treatment combined. The itchy scalp may be relieved once the crusting has been removed. The removal of the crusting must not be attempted at home. Secondary infection may result. The itchy scalp psoriasis may be exacerbated. In cases of Scalp Psoriasis, skin cells proliferate (mitosis to natural exfoliation) up to 10 times quicker than that of normal skin. A typical skin cycle would last approx. 27 – 40 days. In cases of Psoriasis, proliferation can be reduced dramatically depending on severity. The only way to treat Scalp Psoriasis is to slow down the cell mitosis. Shampoos alone will not help. Patients with visible lesions understandably suffer embarrassment and in some causes depression. Arthritis may co-exist. 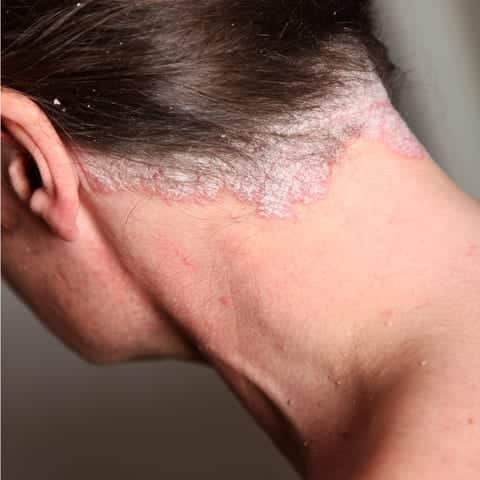 Some scalp psoriasis patients suffer arthritis and related functional disability. Arthritis may improve as the skin recovers. Recurrences may be seasonal and may be associated with reduced natural sunlight. The cause is unknown, but research suggests white blood cell abnormalities trigger rapid skin cell proliferation and exfoliation. Treatments – Topical and systemic therapies may help. We employ safe effective treatments in the management of the condition, removing the irresistible urge to scratch. Thus aiding healing of the skin. Although not curable, this is a condition that can be controlled to allow you to conduct your day without the worry of irritation and flakes on your clothing. If you have any further questions please contact the free advice line above. You will be transferred to the on-call trichologist who will be pleased to assist. Or complete the contact page and a trichologist will reply via email.